So here is my first ever review!! During this winter season my skin become very dry and dull I got some black marks and pimples on my face so, I visited nearest herbal products store in my locality where I found "Bajaj Nomarks Neem Face Wash" and after some days I am amazed by the results . I am 99% satisfied . 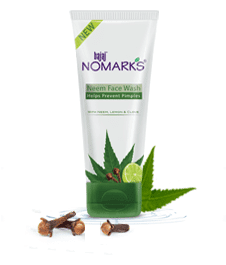 "Bajaj Nomarks Neem Facewash" contains encapsulated beads of "NEEM" that helps to remove excess oil, deep rooted dirt and especially it provides relief from sunburn, blemishes and it is perfect for acne and pimple problems. This Neem facewash is enriched with organic active ingredients which are Neem, Lemon and clove. "NEEM 's" antiseptic properties act as antibacterial agent while "CLOVE" prevents acne "LEMON" protects exposure to sun's UV rays. I love the refreshing fragrance of neem, lemon and clove. Don't leave skin dry after wash.
Removes all the dirt from skin. Makes skin soft and clear. Opaque tube with flip open cap. 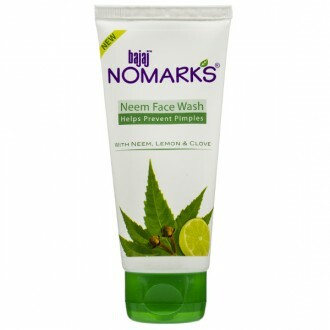 Apply the new Bajaj Nomarks Neem Face Wash all over your wet face in a circular motion. Wash it off and pat dry. Use it twice a day for the best results. Yes!! I will recommend it. It's usually for all skin types but I especially recommend it for combination skin type. Make Your Hairs Free From Chemicals.